Blood 24/7 aims to make blood more accessible to patients, by matching patients and donors directly by blood type. Teknika is an Indian based, innovative technology provider, aiming to create path-breaking products for the future. Our mission is to provide our customers with courteous, affordable, quality-technical and exceptional customer service. 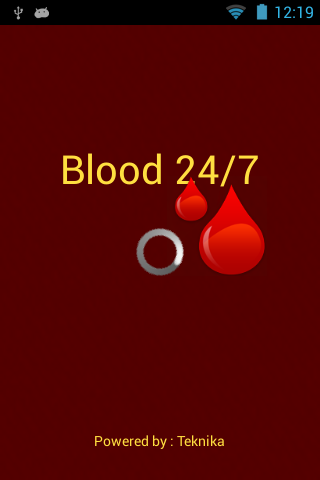 Blood 24/7 connects patients and blood donors through a free Android app. In India, getting required blood can be a challenge; even though blood supplies exist, there was no resource for patients to find needed blood, meaning individuals often searched for a blood donation through social media and other sources. The developers identified a need for an integrated platform that would improve access to the right blood type. It has started with individuals, but the app is exploring partnerships with hospitals and blood banks. This program helps meet blood requirements. It helps to connect to donors of the same blood group . This program can be used across cities and easily be replicated in different geographical locations. The program had 150 downloads in its first day, and has over 500 in its facebook group. This project is launching a nurse practitioner-based comprehensive fixed-price health care system in Tamil Nadu. The venture will comprise a nurse-led primary healthcare facility offering diagnostics and outpatient care. A referral network will build a full healthcare continuum. ArogyaUDHC (User Driven Health Care) is an internet-based platform that servesserves to address the low doctor to patient ratio, specifically specialists, in rural India. The platform accommodates multiple stakeholders, learning and care giving collaborations.